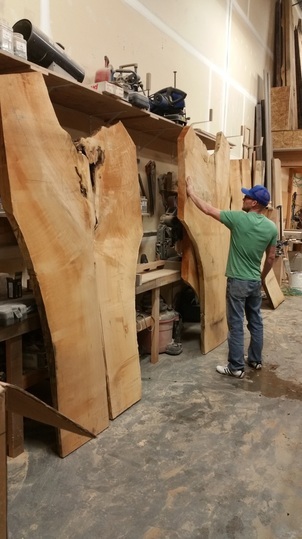 Live Edge Slabs are derived by environmentally friendly methods. Eternal Timber and Design works together with our local arborists as well as arborists across BC who recycle felled BC trees removed by reputable local arborist and local municipalities. The standard 3” live edge slabs are available in a variety of sizes and species. We offer single slabs as well as book matched sets, meaning they were cut consecutively from the same log. Using book matched slabs allows you to create wider surfaces with a mirror image effect. We focus our salvaging efforts on all domestically grown, local woods. Commonly salvaged species include: Douglas Fir, Cottonwood, Maple, Red Woods and Elm. Most Live Edge Slabs are available with a live edge on both sides. These solid wood Slabs are perfect for creating custom Live Edge Slab kitchen, dining, boardroom, coffee, and console tables. Desks, benches, even mantles, or shelving. All kiln dried, our Slabs come rough sawn in random widths and lengths. Please visit our showroom for viewing current stock. Or email sales@eternaltimber.com with your inquiries. Our slabs are kiln dried and CNC planed for a quick start on your DIY projects. Sanding and finishing will create your very own one of a kind Salvaged Live Edge Slab or Reclaimed wood table.